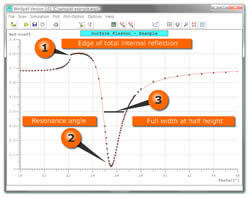 Tutorial 2: WinSpall SPR simulation software. Also have a look at our theory section. To be honest: Using our instruments and analyzing the data you measured needs to be learned. That is why we put together some tutorials that give you a compilation of hints. Up to now we have put together two tutorials: A short one that explains which typical features are found in SPR curves and how these are influenced by the various optical parameters of all materials involved. The second tutorial is dedicated to WinSpall. This SPR simulation software was developed at the Max-Planck Institute for Polymer Research and can be downloaded from the MPI servers. Are our tutorials helpful for you? Would you wish to see a certain SPR topic covered? Drop us a note - we appreciate any feedback.